The new 1.75″ A.M.P. (Accessory Mountain Plate) from MatchPoint USA is now available. This flexible polymer (Tufmax 720) plate is absolutely riddled with anchor points so that it can mount a variety of sheaths, holsters, and accessory pouches at almost any angle. The belt-mounted plate is durable enough to act as a sturdy platform for attaching heavy items and flexible enough to conform to the wearer. 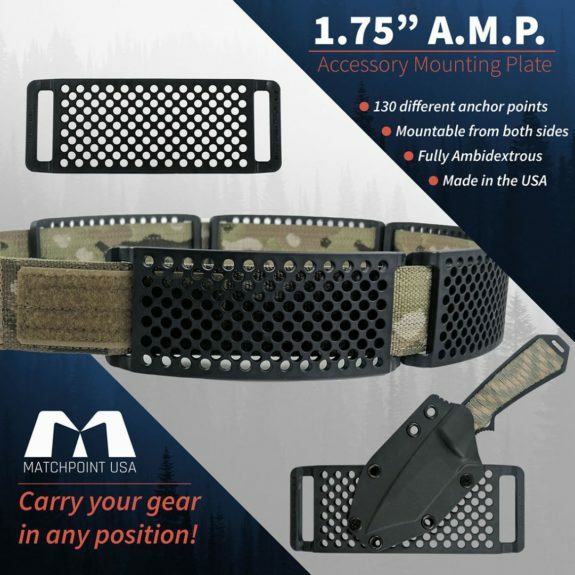 MatchPoint USA is selling the A.M.P. individually or with volume discounts so I would expect to see various other kydex benders incorporating these in their work. There looks to be a lot of versatility and potential built into the A.M.P.